Meet the others, Just chill, relax and then unwind. The Kingdom Hearts Wiki has a variety of Chat channels to socialize with others. They are primarily used for chit-chat, but are also a different and quicker way to notify a staff member about a problem with the wiki. They should also, if possible, be used for socialization with other users rather than through the use of the user's talk pages. Play nice with others - Neither channel will be used to insult others or put people down, between regular users or staff members. If you continue to insult someone or flame the channel with nonsense, you will be banned. If any user expresses that you are annoying them with an action, message, or joke, you are to respect their wishes and stop. Caution: spoilers are expected - We will try our best to prevent any users from spoiling the events of future Kingdom Hearts games, but be warned that not all users will be able to be stopped fast enough to prevent you from remaining "unspoiled." You can ignore a user's messages through the ignore command (----- /ignore nick), and clear all messages from your screen by using the clear command (/clear). The channels use the wiki's native tongue - Please use proper English. 133t Sp33k is not something we want to read. Abbrevations such as "YGOTAS", "KH", and "FFWiki" are acceptable, but please try to stay within reason. Repeated use of "text talk", such as "idk", "omg", "bff", and etc. just gets annoying, and the community tends to dislike it. Be yourself - Do not abuse the /nick function to rapidly change your nick. While it is considered acceptable to change your nick temporarily for a short period of time once the community has identified you, it is not okay to change your nick several times in a short period of time. In addition, sockpuppets will not be tolerated. If you are a suspected sockpuppet, you will be banned. Don't think we're stupid, we've dealt with plenty of socks and flamers; we will identify you, confront you, and ban you. It is preferred that you use your Kingdom Hearts Wiki user name on the IRC, but this is not mandatory. There is a 16 character limit for user names. The channels are not to be abused for role-play - We are aware that we have many users who are part of the channels regular community who can be very comedic, but do not abuse the me command (/me) to role-play across entire screens of attacks, actions, and waves. Abusing this command will be counted as spamming the channel, and will get you kicked or banned from the channel. Do not spam the channel - Nobody wants their chat window to be filled with repeated lines of the same message. Spam is not fun for us to deal with or for anyone to read, nor is it funny. Spamming the channel with any material will get you kicked or banned. Watch what you post - More often than not, users will share content to provide entertainment to others, however sometimes such content goes beyond the norm of our website, in which case you should add a tag with what you're posting, because nobody wants to see something unpleasant. You may not hide or otherwise make the tag hard to read with control codes. A certain form of social etiquette is required. The IRC Channel is one of the channels the wiki uses. 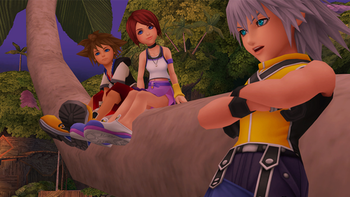 The wiki has two channels: #KHWiki-social and #KHWiki-noticeboard. The topic range for the #KHWiki-social channel is very broad. The channel is not restricted to Kingdom Hearts talk. Discussions can relate to anything from one's favorite character, to a more off-topic subject like how one's day has been. Discussions about the wiki, however, are better suited for #KHWiki-noticeboard, the main IRC channel for this wiki. #KHWiki-noticeboard is only used to discuss official manners, policies, and staff meetings, so please do not act socially in the channels. The following is a list of channel operators for #KHWiki-social and #KHWiki-noticeboard IRC channels. Channel OPs have ability to kick, ban and quiet other users in order to maintain the channel. You can either use a web gateway in your web browser or install a specialized chat program called an IRC client. These are available for a variety of platforms. Freenode webchat, a qwebirc gateway, is a convenient web client that lets you join our channel from a normal web page. Simply type in your nickname and ensure that "#KHWiki-social" or "#KHWiki-noticeboard" is in the channel box. If you wish to identify to NickServ at this point, tick the 'Auth to services' box and enter your NickServ username and password. Click here to enter #KHWiki-noticeboard or click here for #KHWiki-social. You can also go here to join the chat without even leaving the KHWiki! There are many IRC clients; some of the most popular are listed below. For a full list of IRC clients, see Comparison of Internet Relay Chat clients on Wikipedia. mIRC - Full client with extensive configuration options and a wide range of scripts available. Note that mIRC is shareware, not free, although it can still be used after the trial period expires by simply ignoring the registration prompts. Other notable Windows IRC clients include HexChat, irssi, KVIrc, Miranda IM, Quassel, Trillian,XChat and XChat 2. Other notable Mac OS X IRC clients include Adium, Colloquy, Ircle, LimeChat, Quassel and Snak. Other notable Linix IRC clients include Konversation, Kopete, KVIrc, Quassel, WeeChat, XChat and ii, as well as ircII and its derivatives. Many IRC clients have "freenode" in the default network list; you only need to select it. After you are connected to the network, type /join #KHWiki-social or /join #KHWiki-noticeboard in the input box and press Enter. The #KHWiki-social and #KHWiki-noticeboard channels use UTF-8 encoding, just like the Wiki proper. This should not pose a problem with English, as UTF-8 is backwards compatible with ASCII-127, but non-Latin scripts (such as Greek, Cyrillic or Chinese and Japanese characters) may be rendered improperly in UTF-8-incapable clients. Most of the IRC clients mentioned above support UTF-8 encoding in their most recent releases; however, be aware that some may not have UTF-8 encoding set as default. All commands must be prefixed with a forward slash (/). /nick new-nick-here: changes your nickname. As Rule #4 states, this is not to be abused. /me action-here: Makes the "<" and ">" disappear from your next message to portray an action. For example, "/me defeats Roxas" becomes "*[Nick] defeats Roxas". As Rule #5 states, this is not to be abused. /query nick-here message-here: sends a private message to the specified nick. Starts a "PM", also known as a "Query". /ignore nick-here: ignores any message the specified nick sends. This is a client-side function and will not work on the web gateway. /join #channel-here: join another channel. Only works with other channels on the current network. /quit message-here: quits IRC and leaves a message. /part #channel-here message-here: leaves only the current channel. /clear: clears the current log. Useful if your chat window begins to lag. /ns ghost username yourpassword: "ghosts" or logs off a nick. Useful when you suddenly get logged off and see your old nick online when you log back on. You need to register your nick before you can use this command. See below for instructions on how to register. /ns regain username yourpassword: Has the same effect as ghost, but automatically renames you to the ghosted nickname. This list is by no means exhaustive. Further information can be found by typing /help or on IRChelp.org. See this page on the freenode website for full details on nick registration. Do not include the <>. Replace <email> with your address, and <password> with the password you would like to use for the account. This will register your current nick. You will receive an email from freenode. Open it, and follow the instructions. If you do not verify the account in this way, it will be automatically dropped after 24 hours. You will be notified if anyone has attempted to identify to your nick. Although nicks registered on freenode do not automatically expire, they will be eligible to be dropped by a network staffer once they have been unused for ten weeks plus one additional week for each full year of registration. when using the nick that you would like to group to your account. You must be identified to your NickServ account to use this command. Do not collect excessive numbers of nicks. Allows you to retain ownership of your preferred nick. Makes it more difficult for other users to impersonate you. Allows for easy identification by other users and operators. Allows you to forcibly disconnect ghosts and other users using your nick. If you are using a client rather than a web gateway, it is recommended that you set up your client to automatically identify to NickServ to ensure that you are always signed into your account when you are connected to freenode. Instructions on how to do this can usually be found on the IRC client's website. This page was last edited on 25 December 2017, at 03:50.